The National Roofing Contractors Association suggests inspecting your roof twice a year, preferably in the spring and fall. This helps prevent structural damage and locates minor defects before they become major issues. New View Roofing provides comprehensive roof inspections to ensure your commercial roof is performing to its maximum ability. Structural Inspection: We first assess your roof for uneven planes, signs of sagging and the condition of the soffit, fascia and gutter system. Material Inspection: One of our trained roofing contractors will inspect for loose, missing or curling shingles. We’ll also check for stains, rust and missing flashing or fasteners. Interior Inspection: The inspection of your roof shouldn’t only include the exterior. Our team will also check the attic and interior ceilings and walls for water stains, rot,= or mold. 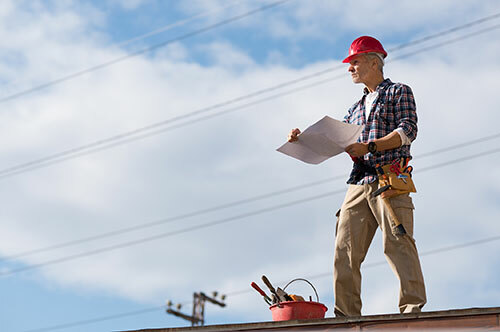 Workmanship Inspection: We’re highly-trained in proper installation techniques, which gives us an advantage when examining your roof for previous workmanship errors caused by other contractors. Roofing Analysis: After the inspection is complete, we’ll give you a detailed report about the health of your commercial roof and any issues we deem necessary to repair. We’re happy to provide you with a free roof repair estimate and our professional recommendation moving forward. In the aftermath of a storm, we understand you want your property repaired quickly and efficiently, so your business facility can get up and running again. A member of our team with be on-site within 24 hours after you submit a request. During your storm damage roof inspection, we’ll check for hail damage, wind damage and other concerns. New View Roofing provides in-depth, thorough inspections by our expert team of roofing contractors. Take preventative measures today! Call (469) 232-7220 or fill out our contact form for your free commercial roof inspection.